"Children of Destiny is a Christian ministry dedicated to bringing God’s hope, life, and restoration to families and individuals struggling with autism and related disorders through the development and promotion of effective prayer, inspirational messages, and spiritual support." DAILY PRAYER - One for Parents with autistic children; One for Family and Friends. You can sign up to have these prayers sent directly to your inbox. DAILY PRAYER JOURNAL PAGES - easy to print out. BULLETIN INSERTS and other handouts. Be sure to check them out and, if you have a child with autism (or are a friend/family member of someone dealing with autism), sign up to AT LEAST receive the daily prayers in your inbox. 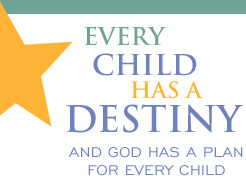 MONETARY DONATIONS to Children of Destiny are tax-deductible, and are greatly appreciated.